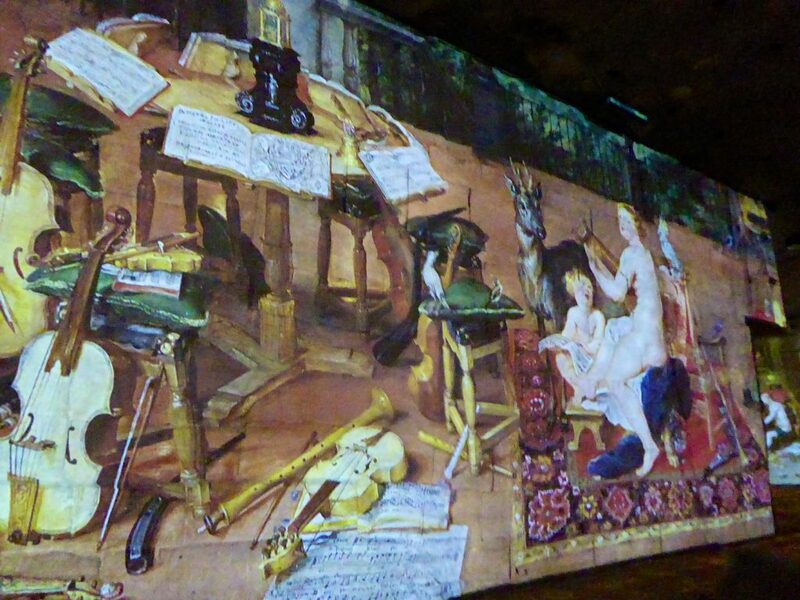 Carrières de Lumières 2017 the fantastical creatures and allegorical figures of Bosch, Brueghel and Arcimboldo. Suddenly, dominating the sky-line, hugging precariously to the craggy, limestone hillside the magnificent ruins of a medieval château became visible. Squinting in the bright winter sunshine, one could almost hear the distant shouts from its ramparts and imagine the clanking of armour and swishing of velvet gowns as the ghosts of a bygone age scurried between the shadows of the medieval buildings of this mystical place, the stunning perched village of Les Baux de Provence. We twisted up the hairpins approaching the village and as it fell behind us we followed the road’s curving path downwards merely a few hundred meters further towards the hidden bauxite caves nestled just below. 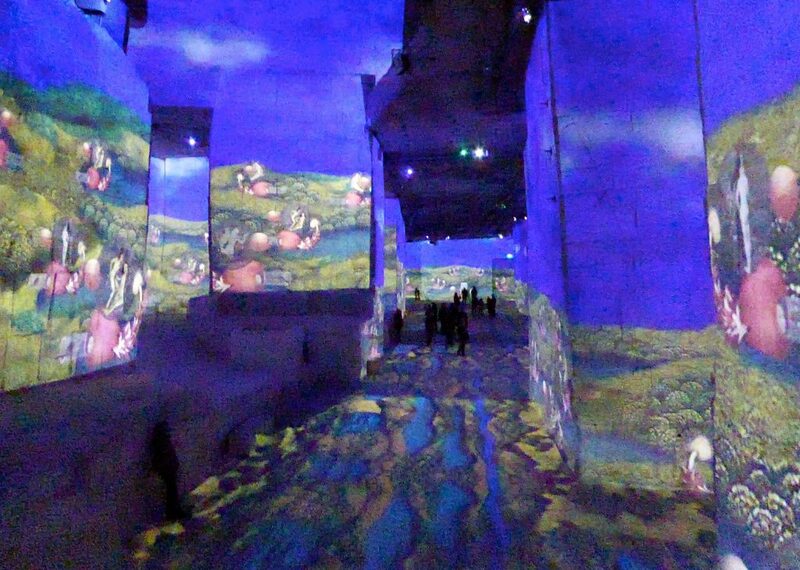 Our destination was Carrières de Lumières where we knew its video art extravaganza would transport us, this year into the world of the artists Bosch, Brueghel, Arcimboldo, ‘from the fantastic to the wonderful’. the incredible geniuses of the maestros are splashed upon the towering space of the former bauxite quarry in Val d’Enfer. 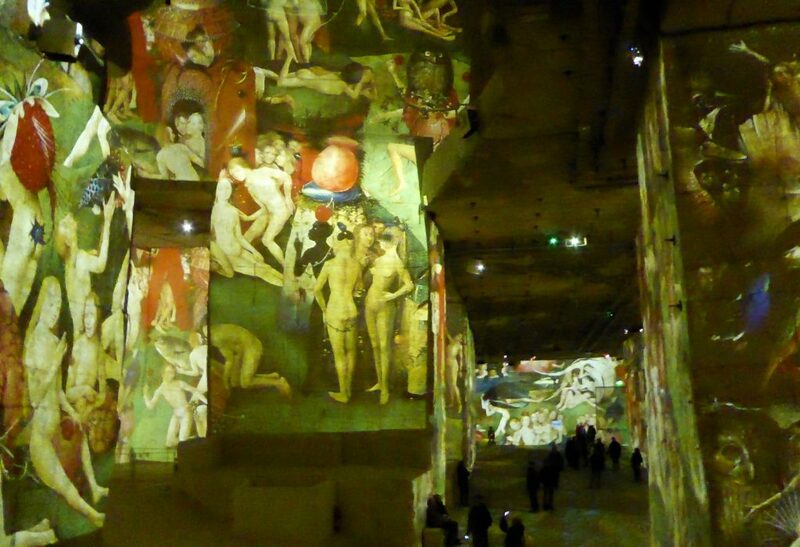 Transformed by art of the world’s Masters, it is an unforgettable and heart stirring experience. 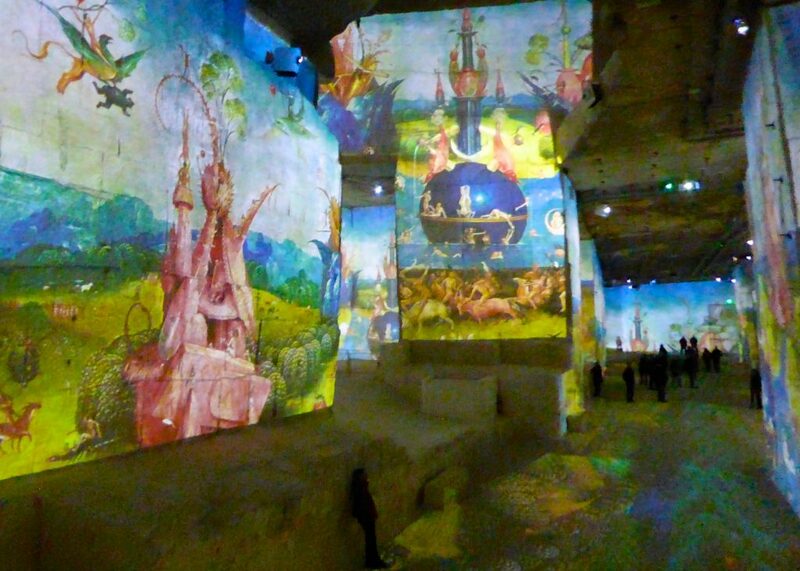 This year was no exception, once again we were entranced, both by the brilliance of the artists and the modern technology as unseen paintbrushes swept over 2000 digital images of incredible artistic talent across the 7000 square meters of the quarry’s walls, floors and ceiling. 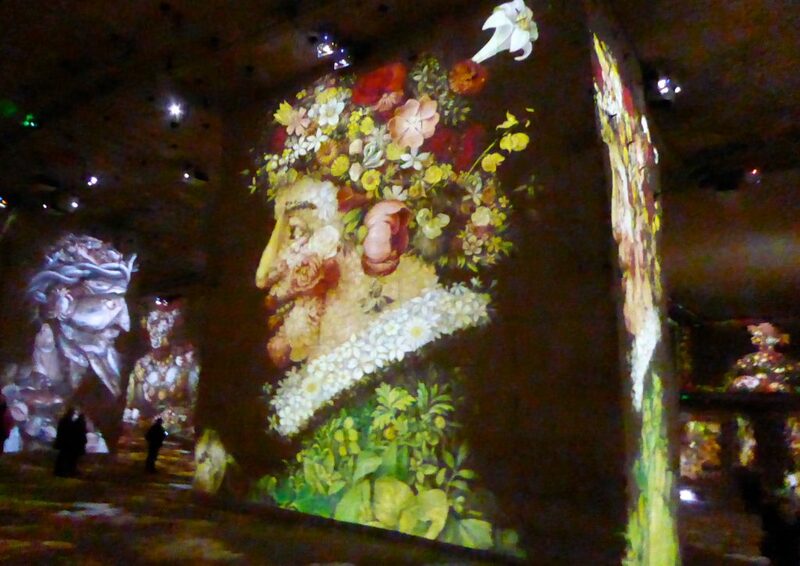 Miraculously, the stage of Carrières de Lumières was consumed by the fantastical creatures and allegorical figures of the fifteenth & sixteenth century artists Bosch, Brueghel and Arcimboldo. Magically it was bought to life by an invisible conductor, skillfully orchestrating the music of Carmina Burana by Carl Orff, The Four Seasons by Antonio Vivaldi and Stairway to Heaven by Led Zeppelin as each scene faded in an ever-changing kaleidoscope of wonder. Every year, no matter the artist, the length of time you stay or how many of the 30 minute performances you watch you will be spellbound. and you will leave enchanted but excited to return. 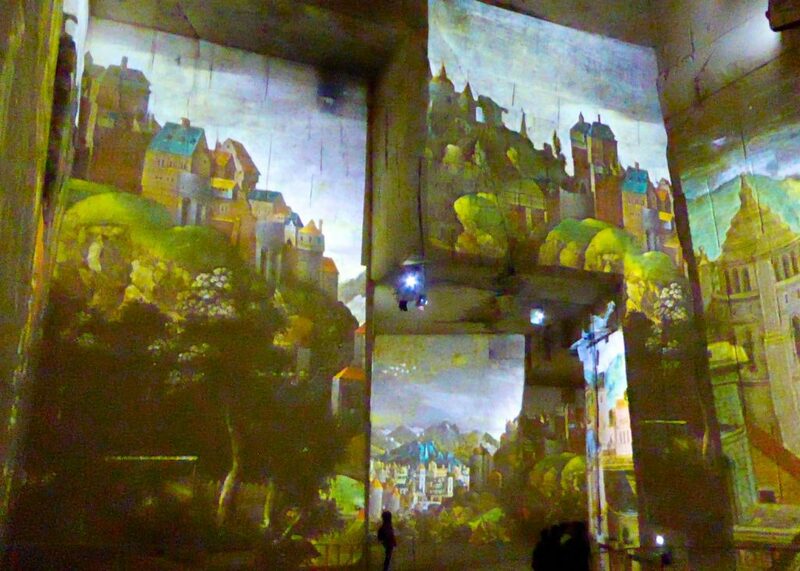 If you haven’t been yet hurry, there are just a few more weeks of Bosch, Brueghel and Arcimboldo’s fantastique et merveilleux performance, it ends January 7th. 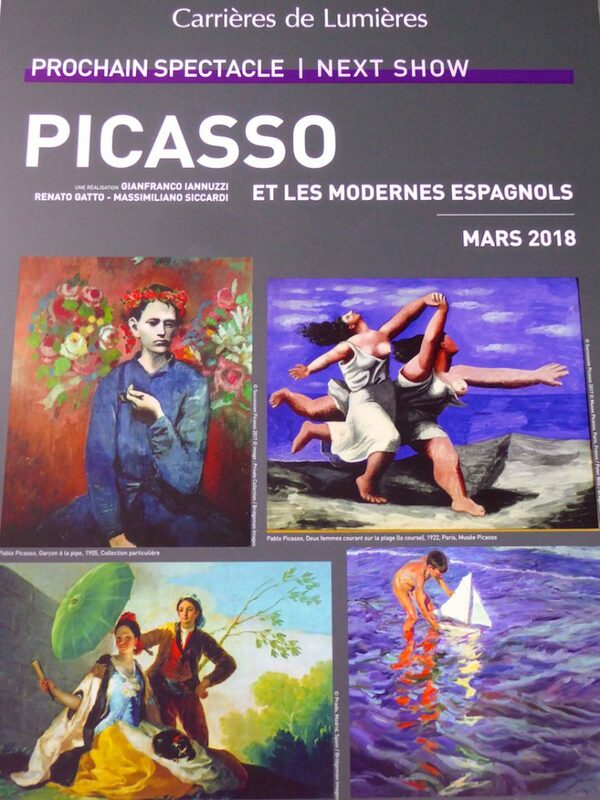 We will then all wait, in eager anticipation for next years spectacle, ‘Picasso et Les Modern Espagnols’ it opens March 2018, I’ll be going won’t you!? 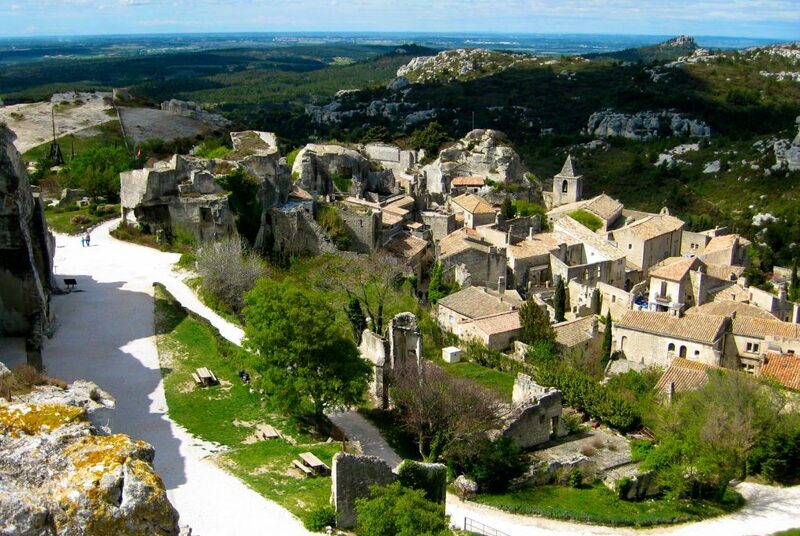 Combine the entrance ticket with entrance to the Chateau ruins of Les Baux for a fascinating self-guided audio tour transporting you back to the time of knights and swash buckling heroes. 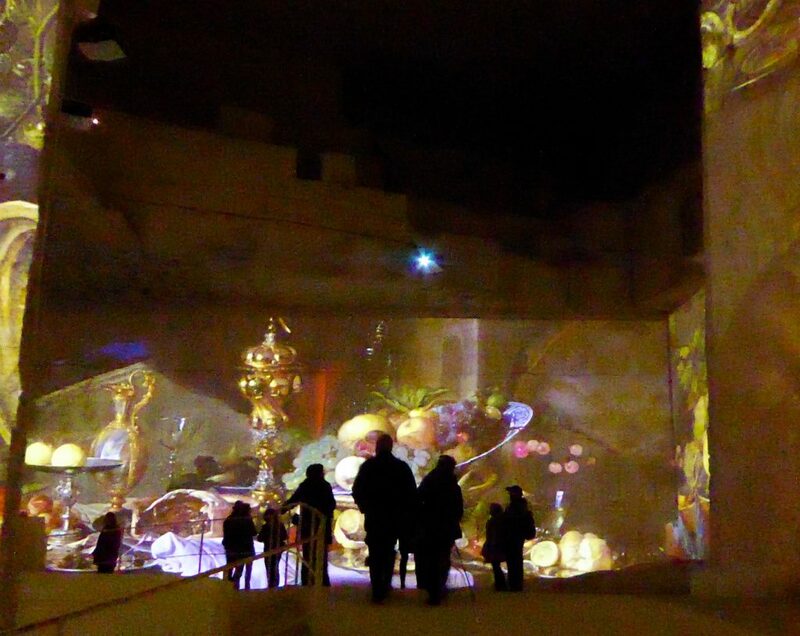 Don’t miss the video film of a helicopter ride over Provence, shown in the small chapel near the exit. 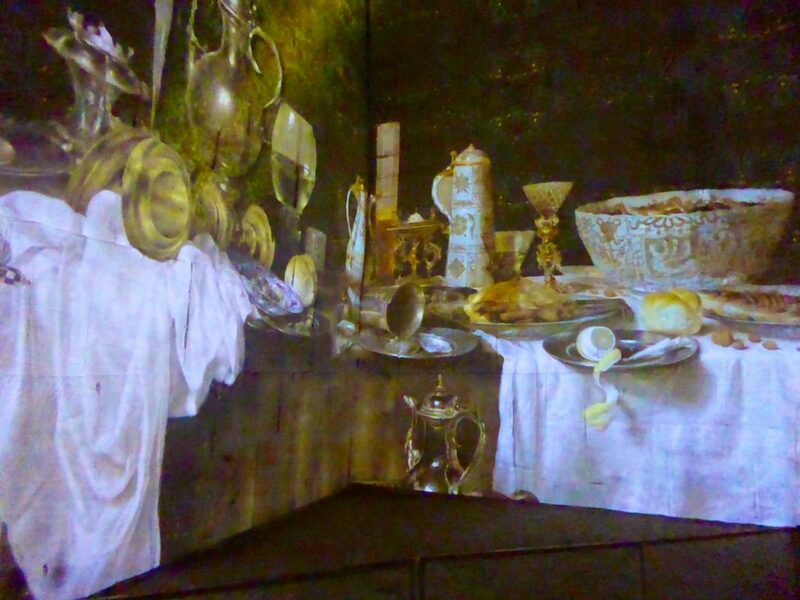 Eat elsewhere, in nearby St Remy-de-Provence, Maussane-les-Alpilles, Maussane-les-Alpilles or Arles, the Les Baux dining choices are disappointing. 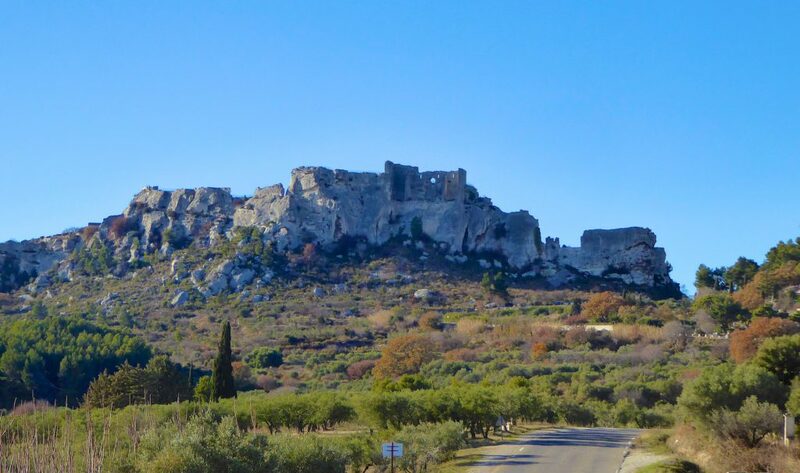 If you have time, visit one of the many olive mills and wine domains in Valley Le Crau and the Roman road Via Aurelia below Les Baux on your departure. 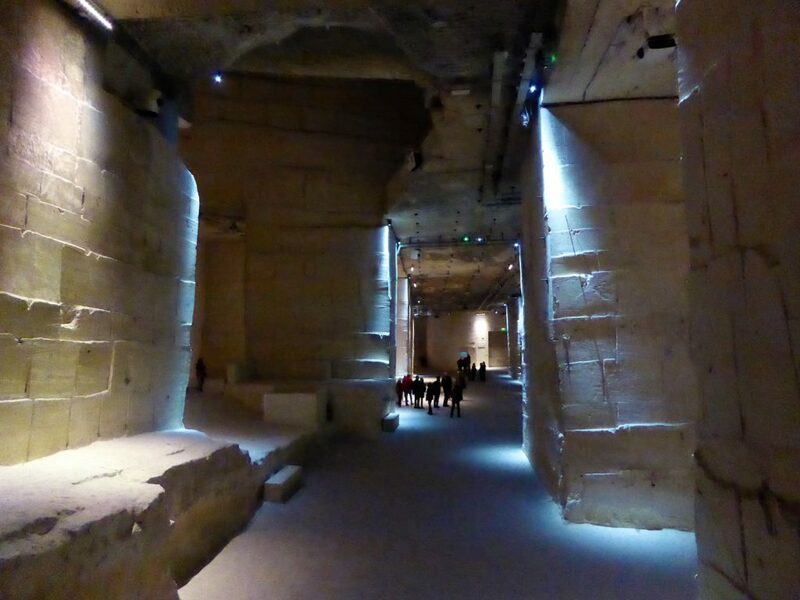 Loved the spectacular Les Baux when we visited in June. 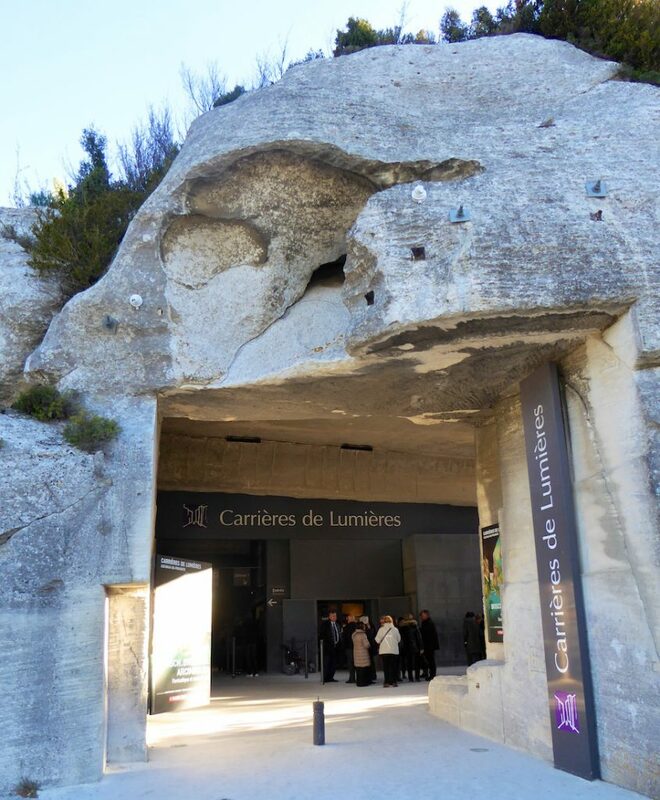 The Carrières des Lumières sounds like a wonderful reason to visit in winter. Wonderful photos. 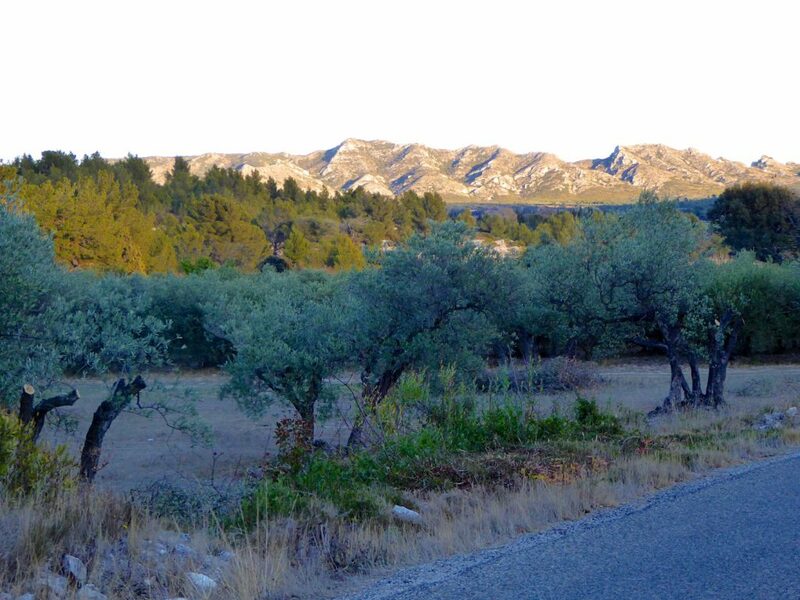 Previous Article Our house in Lourmarin Part 2~ when all is not so wonderful!